The EVGA GeForce GTX 1050 hits the perfect spot for that upgrade you know you need, but at the price you want! With the latest NVIDIA Pascal architecture, the 2GB GTX 1050 displays stunning visuals and great performance at 1080p HD+. Installing a EVGA GeForce GTX 1050 gives you the power to take on today's next-gen titles in full 1080p HD - with room to spare. These cards give you a choice of memory sizes, cooling options, factory overclocks, and power options to fit every need and every system. Of course, no GTX card would be complete without essential gaming technologies, such as NVIDIA GameStream, G-Sync, and GeForce Experience. 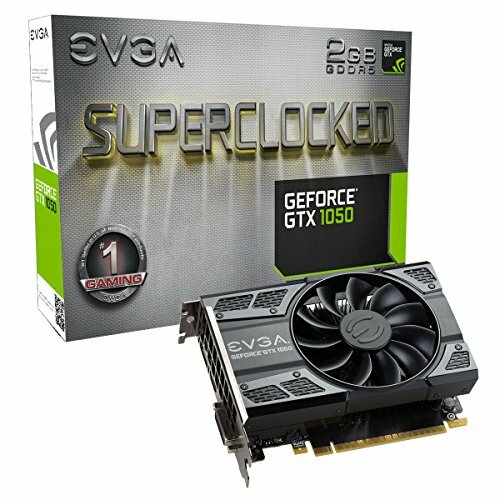 If you've been waiting for that card that gives you the performance to take back the competitive edge, but without taking out your wallet, then the GTX 1050 is the card for you!